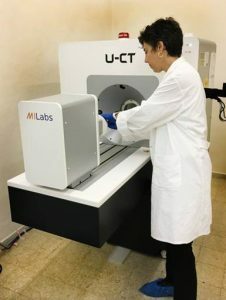 MILabs installs microCT system at the Hebrew University of Jerusalem Israel. Home/News/The Hebrew University of Jerusalem installs MILabs’ dual-energy, high-resolution microCT for imaging drug delivery. A MILabs dual-energy, ultra-high resolution U-CT system has been installed at the Hebrew University of Jerusalem Israel (HUJI). Under the direction of Professor Galia Blum, this institute has established an internationally renowned research program, focused on drug design, delivery, and therapy. The Blum Lab uses synthetic chemistry methods for generating new probes that will be used for simultaneous non-invasive imaging and real-time treatment of pathologies. Most research projects in the Blum Lab combine chemical synthesis, cell biology, biochemistry, microscopy and in vivo imaging. With the addition of MILabs’ latest U-CT system, the HUJI expects to further accelerate drug discoveries in several pathologies such as cancer, atherosclerosis, arthritis and autoimmune diseases. Prof. Beekman, CEO/CSO of MILabs adds: “We are very pleased that this renowned Institute of Drug Research has selected MILabs’ ultra-high resolution in-vivo microCT to further advance its research work. Through extensive R&D, we have succeeded at developing a very dose-efficient X-ray CT system and we are confident that Prof. Galia Blum will be able to push the limits of microCT detection sensitivity using our U-CT with their new class of iodinated nanoscale activity-based probes”. The Hebrew University of Jerusalem was founded in 1918 and opened officially in 1925. The institute is Israel’s premier university as well as it’s leading research institution. The Hebrew University is ranked internationally among the 100 leading universities in the world and first among Israeli universities. Particular outstanding developments resulting from the research at Institute of Drug Research – Faculty of Medicine include the drugs Exelon used to treat Alzheimer’s patients and Doxil for use in ovarian cancer, plus a cherry tomato variety optical imaging agent with a particularly long and excellent shelf life.